Get ready for another year ender of action and and excitement as the title, poster and teaser trailer for the next movie wars coming this December 2016 has been revealed! Entitled Kamen Rider Generations: Dr. Pacman VS EX-Aid & Ghost With Legendary Riders, this new movie wars will not just star EX-Aid and Ghost but will also include Wizard, Gaim and Drive going against Namco's favorite son, Pacman! The movie will premiere in all Japanese cinemas this December 10, 2017. 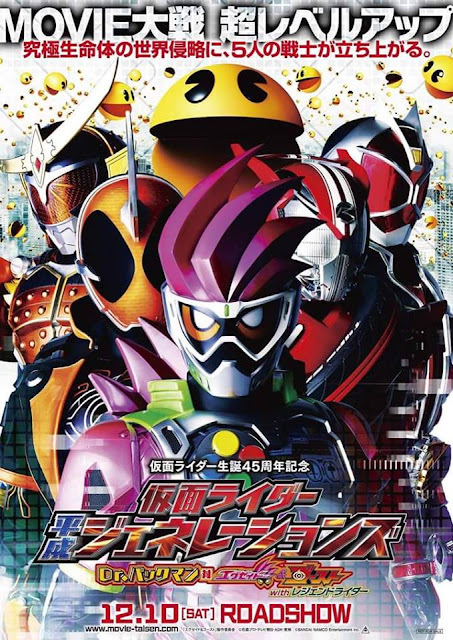 Since they couldn't come up with new badass enemies, they instead decided to have Pac-Man go up against the Kamen Riders, eh? Interesting. Will it be like the movie Pixels or what? I......I.....i'm at a loss for words. I'm probably not the only one. Sakamoto has directed the best KR movies, this one will be no different. The villain will be Pac-Man, eh? Kamen Rider Ghost is going to be so scared, he'll look like Kamen Rider Specter! Pac Man vs. Kamen Rider. What a time to be alive. Please let him eat Takeru. The movie will premiere in all Japanese cinemas this December 10, 2017. Actually, i think it great idea making pacman a bad guy. and it making sense. Remember, Ex-aid is a gamer rider. Kamen Rider Heisei Generations. You also have to read the kanji, right? They're likely gonna nerf or do some half cocked explanation with Kouta being there. Really when a character reaches godly status, I wonder what can they really do when a good lot of things he could just reality warp to finish off? Then again, I'm looking way too far into the capabilities of his abilities and I'm thinking this is comic reality warping level when it's not. It'll be fun though.